When you look at a piano keyboard, it’s normal to feel a lil’ overwhelmed, at first. There are 88 keys, and that can make it seem really confusing. The good news is (no #fakenews here, only the real kind) it’s actually super easy, once you know how. But at the same time, there are way too many keys to keep track of, and the special white and black key pattern can be kinda confusing. Well, it’s time to clear things up! The very first thing you need to know about the piano keyboard is that there are only 12 different keys. Yep, you read that right. And if you can believe it, pretty much all the music you hear nowadays (pop, rock, jazz, classical, etc.) comes from just 12 different notes!! It’s amazing, I know. The first thing you need to know about the piano keyboard is that there are only 12 different keys. So how do we get 88 keys on a piano if there’s only 12 different notes? Well, it’s actually pretty simple. The same 12-note pattern of piano keys just keeps repeating itself over and over across the length of the keyboard. In order to master the piano layout, all you gotta do is learn to spot this 12-note pattern. That’s it! Once you can see the pattern, the rest is just the same thing again and again. Now that we understand the basic idea, let’s check out some piano keyboard diagrams to see it more clearly. After that, you’ll learn how to see the pattern for yourself. This is the special 12-note pattern of piano keys that we need to become really familiar with. So, I’m sure you’ve realized it’s a whole lot easier to spot each 12-note pattern across the piano keyboard layout when the keys are color-coded! It’s all about the special pattern of white and black keys on a piano. This pattern was created specifically to make it easier to find our way around. At this point, don’t worry about memorizing the entire pattern perfectly. All you need to do is focus in on the black keys. These groups of black keys are visual landmarks that help us find our all-important 12-note patterns. Using the black keys, we can keep track of where we are on the keyboard at all times. Notice that beside being a different color, the black keys are also smaller, farther back, and elevated as compared to the white keys. This makes it possible not only to see the difference between white and black keys, but also to feel the difference. Just try to imagine how easy it would be to get lost if all the keys were the same shape, size, and color! Okay, so here it is: the quick way to see the 12-note patterns all across the keyboard. First, find any group of two-black-keys. Notice how the 2 black keys are surrounded by 3 white keys. The white key farthest to the left is the first note of the 12-note pattern. Pretty easy, right? Next, look at the group of 3-black-keys just to the right. This time, there are 4 white keys that surround the group of black keys. The white key farthest to the right is the last key of the 12-note pattern. So let’s see – we have the 2-black-keys + its 3 surrounding white notes (that’s 5 notes all together, if you’re counting at home). Then we’ve got the 3-black keys + its 4 surrounding white notes (that’s 7 notes). Put them all together, 5 + 7, and we have our 12-note pattern. 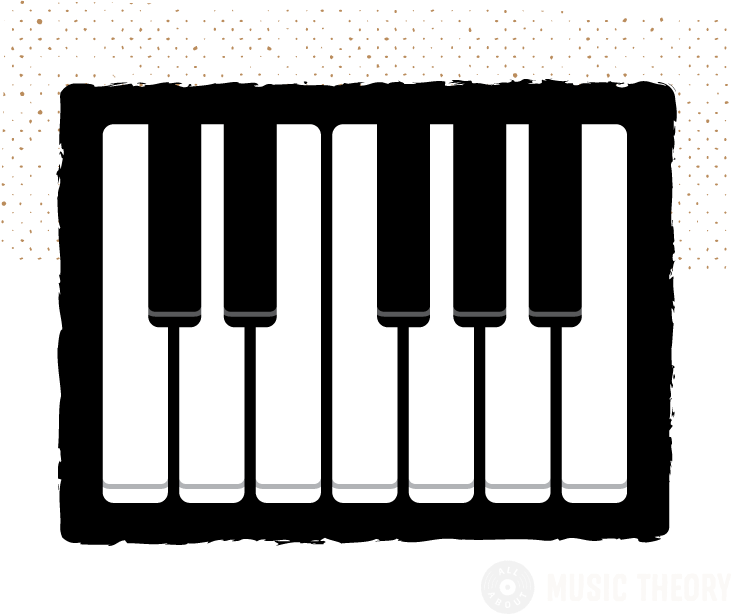 And that’s how we can easily learn to see all of our 12-note pattern of piano keys across the keyboard! There are only 12 unique keys on the piano (and in basically all of the music we listen to). Each 12-note pattern along the piano is made up of a group of 2-black-keys, a group of 3-black keys, plus all the white notes surrounding them. That’s all there is to it. Admit it, it’s pretty easy. I told you it wasn’t rocket science! Okay, so practice, practice, practice! And when you’re ready, meet me in the next lesson where we’ll learn the names of the notes!